Looking for eastern religion & philosophy books? Biblio.co.nz hosts hundreds of of the finest online book stores and booksellers, including specialists in eastern religion & philosophy. Use the list below to locate a specific specialist bookseller or book store near you. Or, use the form below to search the inventory of all booksellers who specialize in eastern religion & philosophy. Yesterday's Muse Inc. is an independent used & rare bookseller that has been in operation for over 10 years. 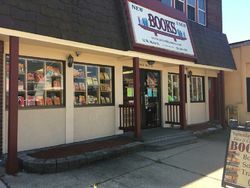 We opened our first 'brick and mortar' storefront in December of 2008 in our hometown of Webster, NY.Owner Jonathan Smalter is a member of the Antiquarian Booksellers' Association of America (ABAA), the vice president of the Independent Online Booksellers Association (IOBA), both of which are trade organizations created to promote ethical online selling practices, and to encourage continuing education among fellow booksellers. He is also a 2011 graduate of the Colorado Antiquarian Book Seminar (CABS). He has fifteen years of experience in the book trade, during which time he has become adept at evaluating used and collectible books.